Jewish organizations in the community are asked to nominate a woman who exemplifies the mission of their organization through her leadership and commitment. Awarded annually the ‘Women of Distinction’ Program honors exemplary volunteerism and leadership. Barbara is the consummate volunteer for Beth Israel of Sun City Center; no task is too big or small for her to say, “I can do that.” She co-chairs their successful rummage sale, sits on the Board of Directors as a Member at Large and the Social Action Chair, and represents the congregation in various social activity in the community. Barbara shares her “New York” gusto with everyone she meets and cheers up a room with her infectious laugh. In her role as Social Action Chair, she fosters their committee’s partnership with St. Andrews Church, Metropolitan Ministry and Meals on Wheels, serving lunch to the hungry each Wednesday, collecting food for the local food bank at the Guadalupe Church and delivering meals to those in need. Barbara is also Director at Large for the Sisterhood Board of Directors. Outside of her synagogue involvement she volunteers with the Senior Friendship Organization, helping fourth graders prepare for FCAT testing and has worked with homeless veterans at Turning Points in Bradenton. Her involvements are vast and varied, but one of her most rewarding involvements is her weekly visitation with a 57-year-old woman with Multiple Sclerosis at a local nursing home. 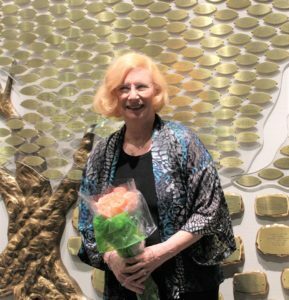 Barbara believes that the Hewlitt-East Rockaway Jewish Center has the most profound influence her life as a single parent and now her involvement with the synagogue has been the best part of her retirement. She is the proud mom of one daughter, Jodi, and grandmother of two, Lexi and Emily, and has a loving significant other of 14 years, Barry Friedman.